'Teenage Mutant Ninja Turtles'. It's a title I can't even pronounce with out putting the melody of the iconic Saturday morning cartoon show into. I mean what kind of subliminal messaging and brand power is that? Get out of my mind!! 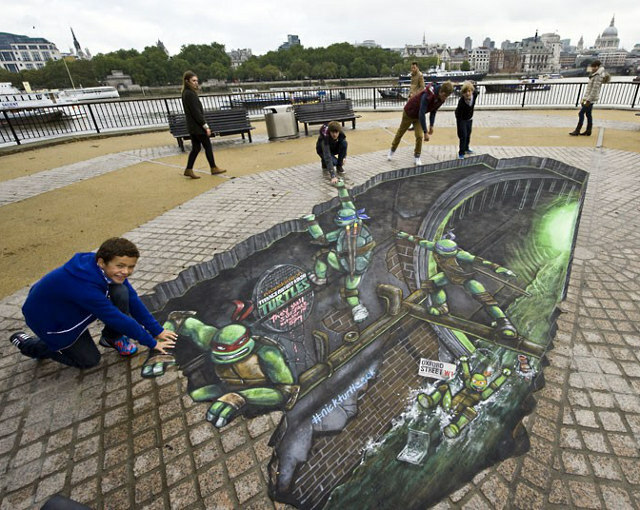 Now as the Turtles prepare to unleash cowabunga-ry on an all-new generation of fans with their upcoming show on Nickelodeon, these painted mats have sprung up throughout London. 3D in nature, fans can reach out and give the Turtles a hand. Isn't that what the kid inside you always wanted to do? This is so amazing and my new wallpaper at least until my children see it. They're going to love it! Nice one Aliera I wish my Mum had been such a turtles fan back in the day! Did you notice in the trailer they've swapped Cowabunga for Boyakasha?! I mean what's with that?